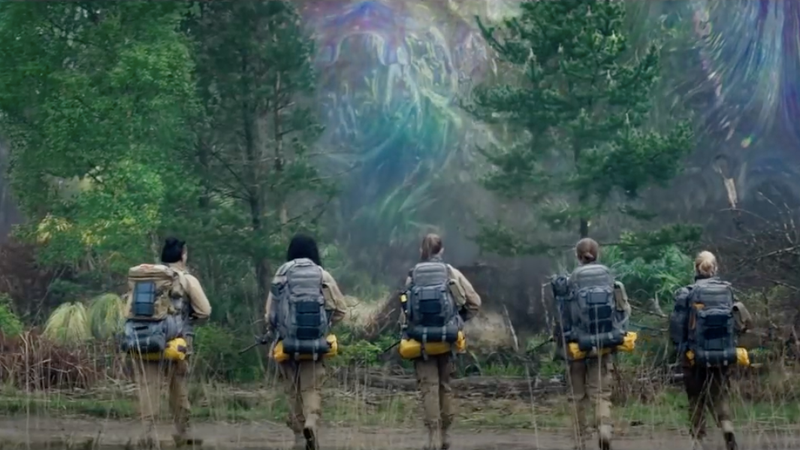 We’ve already gotten a little taste of what the film adaptation of Jeff VanderMeer’s 2014 book Annihilation with the film’s teaser, but now the full trailer is here. All I can say is, never has an old house covered in colorful flowers looked so terrifying! In the trailer we get a fuller picture of the novel’s mysterious “Area X,” replete with pretty, psychedelic foliage and snaggletoothed monsters that will surely destroy you. Natalie Portman leads as a biologist who enters the area (tapered off in the movie by an almost rainbow, oil-slick gooey border) to find her missing husband (Oscar Isaac). And she takes along a crew of female scientists played by a literal dream team: Gina Rodriguez, Jennifer Jason Leigh, Tessa Tompson, and Swedish actress Tuva Novotny. And if all of that wasn’t enough to get you to the theater, the project is driven by dystopian screenwriter Alex Garland of 28 Days Later and Never Let Me Go, who directed his first film with Ex Machina. So if there’s anyone who can accurately bring VanderMeer’s futuristic nightmare to the screen, it’s no doubt him.